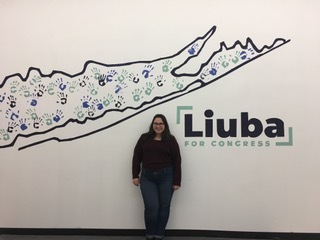 During Fall Break I was lucky enough to have the opportunity to work on Liuba Grechen Shirley’s congressional campaign in New York’s second district. In the past I had worked on gubernatorial campaigns and amendment-based campaigns, so I was eager to see how a congressional campaign worked differently, especially in the weeks preceding the election. In my few days spent with the campaign I learned so much about how congressional campaigns are organized in terms of voter contact strategy and volunteer coordination. Another fascinating thing to observe was how a Democratic candidate operates in a historically Republican district; coming from a very Democratic district myself, this was a big cultural shift for me. As a Government major with a concentration in American Politics I spend a lot of time in the classroom talking about–well, American politics. Being on the ground in the midst of a potentially historic election cycle I saw in action many of the things that we often discuss in class. For example, in my Campaigns and Elections class this semester we’ve been discussing the discrepancy in voter turnout in the midterm elections as compared to presidential elections; I talked to multiple voters who told me that they usually vote in presidential elections but just didn’t see why they should this year. The same class prepared me for the effects of nationalization on congressional elections; several voters mentioned President Donald Trump as their primary reason for voting for or against a particular candidate. Having the historical and academic contexts in mind gave my interactions with voters so much more depth. The good news for people looking to become more politically involved is that it’s an exciting time to be engaged in politics and campaigns always need help in whatever form you can offer it. I believe that what makes political work a rewarding experience for the volunteer is to find a cause or candidate they truly believe in. The reality is that working on a political campaign is hard. Knocking on doors and making phone calls is tiring and frustrating and can often feel like you’re not getting anywhere, but those activities have also been proven to be the most effective ways to contact voters and get them to the polls. These potentially challenging tasks are so much more meaningful if you’re doing them because you really care and if you really believe in your own ability to make a difference. One of the biggest hurdles to getting people involved or even voting these days is an immense feeling of apathy; if you’re engaged or want to be you’ve already taken a hugely important first step and we need you with us on the front lines.